Double Saxon Gate - 7.2m (to suit 7.4m Opening) Handmade in Australia using seasoned Australian hardwood. Includes Hinge Kit, Latch Chain & Free Delivery to nearest depot in NSW. 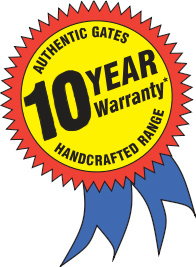 All Timber Gates produced by Authentic Gates not only carry the stamp of true craftsmanship but are also fully supported by a 10 year warranty.